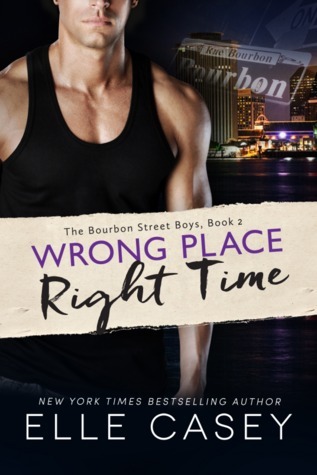 Wrong Place, Right Time is the 2nd book in The Bourbon Street Boys series and the first book I've read by Elle Casey. This book is narrated from Jenny's POV and she's quite a funny girl. She talks way too much when she's nervous and there're various comedic scenes. Jenny was asked by her sister May to help in consulting and possibly freelancing at May's workplace. Once Jenny was there, her adventure starts and she met Dev - a huge seven foot tall guy who's got the cutest dimple. Over the next two weeks or so, Jenny got to know Dev more and more and it's obvious they've fallen for each other. Jenny seems to attract a fair bit of misfortune though as she finds herself in a pickle from time to time. Jenny and Dev finally got together towards the end of the book but I wish their scene could've been even more intense and romantic. Overall, this was a fun book to read and Jenny is very likeable. I hope to read more books by this author!